Basically I could write I wasn’t impressed and it would cover it all nicely. If you ever wished somebody directed the old 1991 animated Disney movie’s remake but with actors, here it is. Still be careful what you wish for: who is to say that a live-action/CGI-animated remake has to be better than the original? Certainly not me. The Beastly prince wasn’t especially ugly and it was hard to believe he truly fell in love. Emma Watson’s Belle wasn’t intelligent enough and/or charismatic enough to make a lasting impression. Her fixation with books , especially Romeo and Juliet, my least favourite Shakespeare play, didn’t endear her to me, not really. She didn’t discover love, just an opportunity. In fact she seemed as desperate as the Beast to change her status quo: he wanted to return to a human form, she wanted to move forward, far away from her mundane, boring village. Because she thought she deserved something BETTER. Yes, I admit some scenes were dazzling but they also seemed just like empty accessories, created to stun you just for a moment. Definitely not my idea of a successful remake. I might sound like an old crone but if you want to watch something truly magical turn to Jean Cocteau’s 1946 classic La Belle et la Bête, which is a film told with the bittersweet poetry the story needs. Or read the fairy tale. 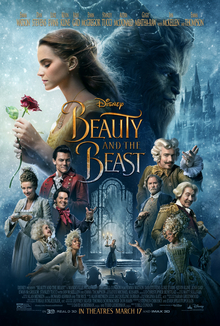 This entry was posted in animation, book-film-show, fairy tale, meh, movie review, rating and tagged 2017 movie, beauty and the beast, disney fairy tale, meh, not impressed. Bookmark the permalink. Awww I’m sorry you didn’t love it. But I agree about Belle….she did decent, but she was not impressive and I can list 5 other people who would’ve brought the character to life better. Emma Watson, with all her experience, is not a great actress, sad but true. Very true but that story shouldn’t be about going for it, not really.